It's been a while since I've posted, so I come to you with one of the most disappointing packs of cards of all time. You are thinking "Its from 1998 and there's one autograph per pack... how could it be THAT disappointing??" Lets look at the cards. First the base cards. 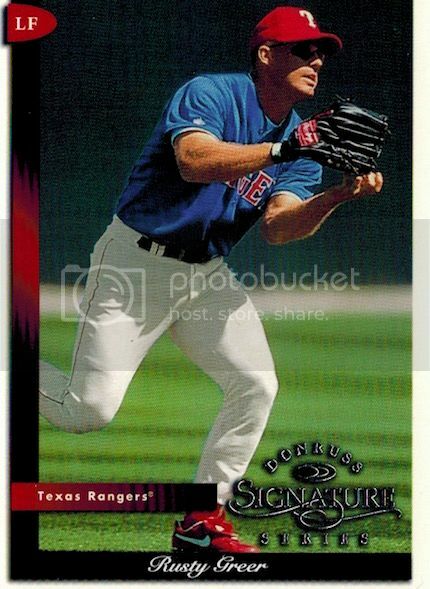 Rusty Greer is a Rangers classic. Respectable career .305 hitter. 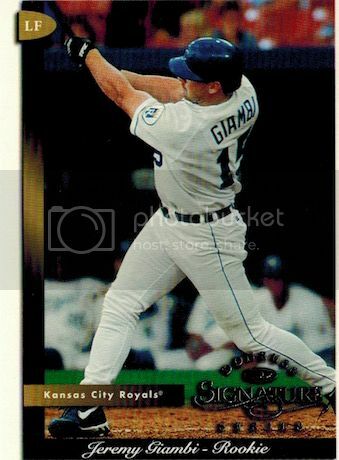 Jeremy Giambi... the other Giambi. The one with 52 career home runs. Tom Glavine! 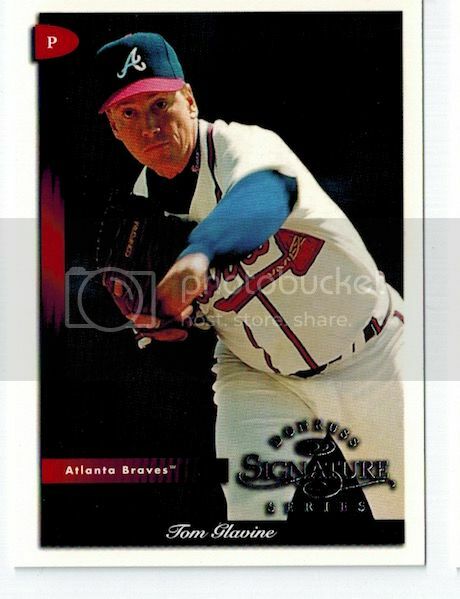 Hall of fame career, legend of the 1990's TBS Superstation Atlanta Braves era. 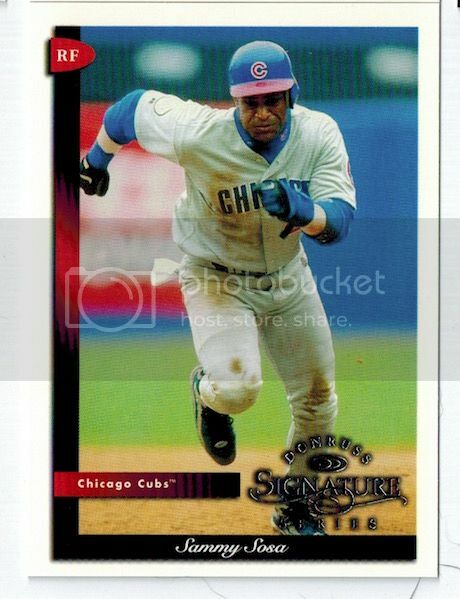 And Sammy Sosa, famous for his home run hitting, steroid use, and rivalry with Mark McGwire. 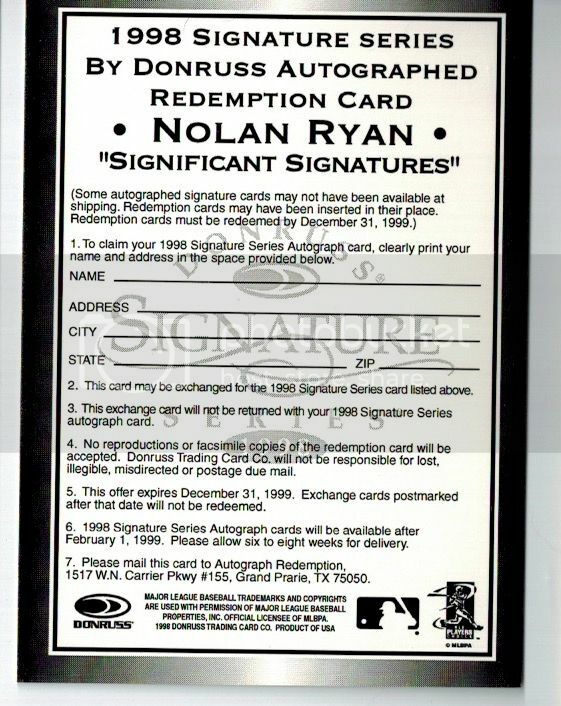 Its a 17 year old expired redemption for a Nolan Ryan autograph!!!!!!!!!!!! Oh no! That's terrible. If that happened to me I would make it my mission to get Nolan Ryan to Autograph the redemption card on the "Name" line. Thats actually a hilarious idea. If he's ever at a convention or something I will do that. This is why you open only '70s and '80s packs. The only heartbreak is pulling a miscut card. You should see if Panini will honor it. I had a similar experience in 2013 with a Topps product from the early 2000's when I pulled a George Brett autograph redemption. Who is my all time favorite player? George Brett so the expired redemption still sits proudly in my PC. Bummer. 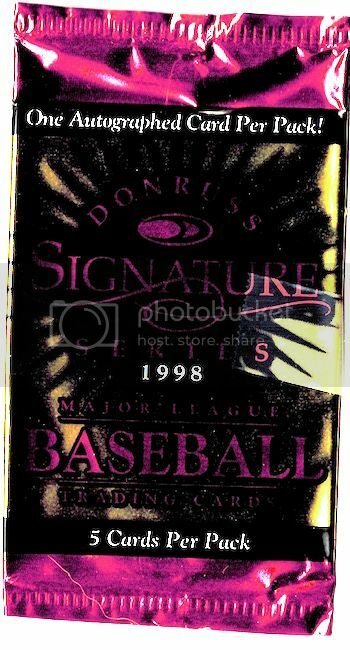 The 1998 Significant Signatures set is beautiful... especially the Ryan, Smith, and Koufax due to their "refractor" versions. Overall... I'd rather pull this Nolan Ryan redemption card instead of a common I could purchase on COMC for a buck. Worst case scenario... it's a card you can tell your grandkids about. 1) Get the redemption card graded. Let's see what PSA or BGS will do with that. 2) Or, call Panini support (not write), and demand some sort of justice. That card was autographed and existed at some time, presumably. Why is it still not in some warehouse of theirs? Or did some angry and/or greedy ex-employee walk out the door with it years ago? Redemption cards are a slime on the hobby, and should be legally treated somewhat similarly like retail gift cards--no depreciation of value, no fee deductions if unused, permanently valid, etc. Imagine this hobby if card vendors declared that redemption cards of years past will be fulfilled. Overnight, boxes, packs, and cases of stuff would have massive runs on them to get those top-of-the-line redemptions all these years later. I figure that if you complain to Panini enough, they'll at least to try to appease you a little with something like a Kolten Wong /350 swatch of underpants or something. At least it's more than zero? send it in and see what happens.